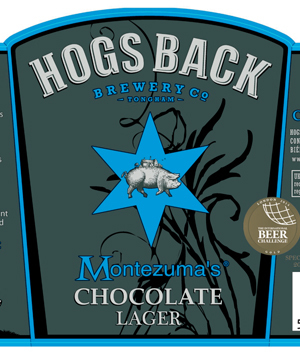 a chocolate company, to create this lager. Most beers with chocolate in the title use dark roasted malts, as the fats in chocolate can cause problems during the brewing cycle. It has a pale bronze color and a luscious nose of rich chocolate, herbal hops and toasted malt. Chocolate blends surprisingly well in the mouth with bitter, spicy hops. The chocolate character builds in the finish but is well balanced by spicy hops and biscuit malt. Here’s a beer that defies the senses. From its bright yellow appearance, it’s a simple pilsner clone, or perhaps a golden ale, but bring it close to the nose and perceptions change dramatically as chocolate notes—rich and perfumed—take control. Lush chocolate inevitably leads in the taste, but this is surprisingly fruity and spritzy for a chocolate beer, with hints of orange and spice in the background. Bitterness builds in the creamy chocolate finish. The novelty factor will undoubtedly boost sales, but it’s also a well-put-together beer and deserves success for that reason, too.